What could have possibly happened here? and no sign of life from inside. staring....wishing it could speak out to me, with answers. Yes, there is a fence in the photo. You will enjoy fences from around the world. that first photo is picture puzzle perfection. just beautiful. 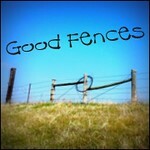 Thanks....I appreciate your hosting of Good Fences each week ! What a great old farm house! Love the round bales! A very nice country scene even with a lonely, deserted house. We might be surprised if the walls could talk as to what happened. Meggie, lovely to see your photos and read your thougts, can really see you sitting there and wondering... Are there many farms like that, distance-farmed? Must have been a wonderful place! No, property is very prime here. I just can't imagine walking away from something like this. But, as we both know, it takes a lot of work to renovate. Both of us have had our share of renovations. Oh I'd be sorely tempted to climb the fence and go for a look around! Its a great old place! Love your photo of it! Thanks, Christine....I've wondered if the property tax office could give me a hint. How strange since there seems to be someone who had to have baled that hay. Lots of times people build a larger home somewhere near property like this. The house looks to have been a nice one in it's day. Hello Ida....and maybe it was left to some children who wanted no part of it. I would so have to peek in the windows and imagine how they lived. First, I would be afraid of trespassing and then there is the threat of snakes this time of year. The windows are very dark...empty looking!